Beach Club Condos For Sale in Gulf Shores AL. 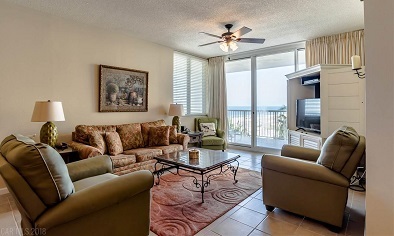 This unique 2BR/2BA resort home is situated in the Avalon building, overlooking the pools and property toward Fort Morgan. No better sunset views exist. Fully furnished residence with new A/C. Gorgeous granite counter-tops in the kitchen and bathrooms. Black appliances in the kitchen. Jetted hot-tub in master bath. Flat-screen HDTVs in living area and both bedrooms. Breakfast Bar. Large owner’s closet. Stacked clothes washer and dryer. Come see this beach property!